Are missing teeth making your life miserable? Has it become difficult to eat your favorite foods, or are you embarrassed in social situations due to gaps in your smile? If so, dental implants may be able to help you and improve your quality of life. 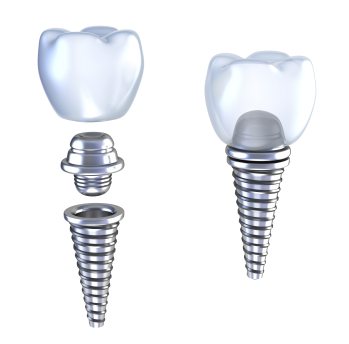 Dental implants are small titanium posts that will be surgically placed into your jaw bone where you are missing teeth. These implants serve as anchors that act like the root for an artificial tooth. After the implants are placed and the bone has had time to heal, the jaw bone will actually fuse to the implants, making them even stronger than a normal tooth. Once the implants have been allowed to heal, replacement teeth can be secured to your implants. Dental implants can open the door to improved self-confidence, allowing you to restore your old eating and socialization habits without feeling self-conscious or worrying about your traditional dentures slipping out of place.